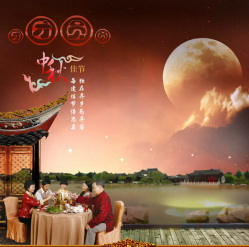 Mid-Autumn Festival has a long history, and other traditional festivals, just as slowly evolved, the emperors have the memorial day of spring, autumn months of ritual sacrifice, as early as "Zhou", a book, there are "Autumn" is records. Later aristocrats and literati also follow up the mid-autumn season, facing the sky, bright, round bright moon, watch the worship of the hands of feelings, so the practice spread to people, to form a traditional activity, until the Tang Dynasty This festival is more people's attention on the custom of Mid-Autumn Festival became a fixed festival, "Tang Taizong in mind," record of "Mid-Autumn Festival", the festival popular in the Song Dynasty to the Qing, the par with New Year's Day has become one of China's major festivals. 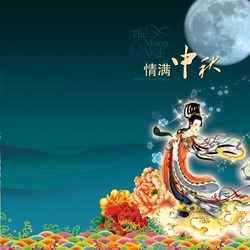 Mid-Autumn Festival legend is very rich, the Moon, Wu Gang cutting Gui, rabbit pound medicine like myths widespread. According to legend, in ancient times the sky on the 10th simultaneously, tan crops withered, hard times, a hero named Hou Yi, the mighty, his sympathy for suffering people, boarded the Kunlun Peak, transport enough god, God opened the bow, stretch the sun shot down more than nine, and ordered the last sun rise and fall time, benefit the people. Hou Yi so respected and loved by the people, Hou Yi married a beautiful and kind-hearted wife named Chang-e. In addition to hunting Hou Yi Chuan Yi, the day and his wife together, people are envious of this Langcainvmao loving couple. Many patriots come here Toushi Arts, evil intents Peng Meng also mixed in. One day, Hou Yi and friends seeking the correct path to the Kunlun Mountains, the Queen Mother after this chance encounter, they would seek the Queen Mother of a pack of elixir. It is said that the drug dose can immediately go to heaven immortal. However, Hou Yi could not bear leaving his wife, had a temporary elixir to Chang E to treasure. Chang E hid the drug's treasure box in the dresser, only to be the villain Peng Meng saw, he wanted to steal their immortality elixir. Three days later, Hou Yi mobilize believers to go out hunting, Peng Meng dismal pretend illness, stayed. Soon everyone was gone to be the rate Hou Yi, Peng Meng backyard holding a sword into the inner chamber, coercion Chang E to hand over elixir. Peng Meng Chang-e know that they are not rivals, when she was critical of the decisive turn open the treasure box, took out elixir swallowed. Chang-e swallowed drugs, the body immediately floated off the ground, out of the window, flew to the sky. As Chang-e worried about her husband, then fly to the moon from the earth into the nearest cent. In the evening, Hou Yi returned home, the maid who cried during the day happen. Hou Yi both scared and angry, Choujian kill bad guys, Peng Meng escaped early, Hou Yi angry crying in the corner, distraught, looking up at the night sky, calling the name of his beloved wife, when he was surprised to find, especially the moon today bringing a bright, but there is a shaking of the figure resembles the Chang-e. He tried to chase them toward the moon, but he went three steps, three steps back the moon, he was back three steps, three steps into the moon, but also fail to recover, no matter how near. Hou Yi helpless, and miss his wife, Chang E had sent to the rear garden favorite, put on the incense table, put her favorite honey usually eat fruit, Yao Ji at the moon's Chang-e in the love of their own. People who heard about the news of the Moon immortality, have furnishings incense table in the next month, the Chang-e pray for good luck to the good peace. Since then, the custom of Mid-Autumn Festival worship in private spreadck peace.